In the era before the advent of factories, folks depended upon skilled weavers to take the flax and wool they had spin into yarn and turn it into clothing. 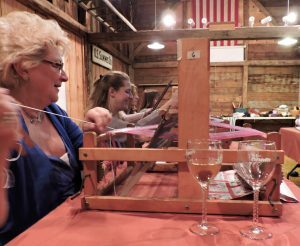 To help folks experience what it was like to weave using manual looms, the Huntington Historical Society is offering a new program, “Weaving with Wine.” during the winter months, we will offer two-and-a-half hour (7pm – 9:30pm) introductory classes to Learn to weave on a table loom. At the end of class, you will have a piece of fabric to bring home! You provide the wine, we provide the weaving and light refreshments! Classes are held at the Conklin Barn, 2 High Street, Huntington.